You are here: Home / Government / News / City News / Kingsport Senior Center: The Fun Begins at 50! 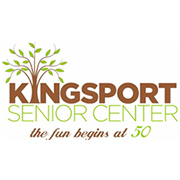 Kingsport Senior Center: The Fun Begins at 50! The Kingsport Senior Center is a community resource dedicated to enriching the quality of life for area seniors. It is reserved for those aged 50 years young and up. The National Institute of Senior Centers (NISC) accredited the Kingsport Senior Center in May of 2015. The Kingsport Senior Center joins only seven other centers in the State of Tennessee in national accreditation. The main facility includes a fitness center, computer lab, pottery workshop with three kilns, basketball courts, shuffleboard, billiards room and a workshop. There are seven branch sites that senior center members can take advantage of in the Kingsport area. For those interested in joining the Senior Center, you must be at least 50 years of age. If you’re a Kingsport city resident, the cost is $25/year. For Sullivan County residents, the cost is $45.00/year. For out of county residents, the cost is $70/year. Your membership is free if you have Silver Sneakers through your insurance company. If you’d like to join the Senior Center, please stop by and register. For questions, please call 423-392-8402. The Kingsport Renaissance Center serves as the main site for the Senior Center. It’s located at 1200 E. Center Street. The Senior Center hours are Monday through Friday from 8:00 a.m. to 7:00 p.m. and Saturday from 9:00 a.m. to 12:00 p.m. The Senior Center has a branch site that also houses program and activities. The Lynn View site, located at 257 Walker Street, is open Monday through Friday from 9:00 a.m. to 2:00 p.m. Other local sites are also used for specific events and will be noted in event information. Many programs are held at the Senior Center and other sites. Roughly 150 programs are available every week, including classes, seminars, and special events. A few of the classes members can take advantage of are basic tai-chi, strength training, volleyball, Zumba fitness, and meditation. Various programs offered to members include quilting, beginning clay, basket weaving, shuffleboard, rook and karaoke! The Senior Center also offers trips for its members. On October 7, the Senior Center will take a trip to Fairview, North Carolina, to the Fall Festival and Farm Tour in Hickory Nut Gap Farm. On November 11, the outing will be to the Dan’l Boone Inn and shopping at the Mast General Store in Boone, North Carolina. On November 15, the Senior Center will take a trip to Sevierville, Tennessee. If the Kingsport Senior Center sounds like the place for you or a family member, feel free to stop by and check it out. If you have questions, please call 423-392-8402.
https://www.kingsporttn.gov/wp-content/uploads/SeniorCenter180x180.jpg 180 180 adrienne https://www.kingsporttn.gov/wp-content/uploads/logo-1.png adrienne2016-10-06 13:38:462019-01-15 07:10:09Kingsport Senior Center: The Fun Begins at 50!